Since 2004 The Brunswick Trinidad Sister City Association has brought the flavors and sounds of our Caribbean neighbor to the streets of Brunswick, Maine. Traditionally local restaurants have also shown their solidarity with Trinidad, Cuba to feature a Cuban dish or beverage in their establishment. This year Cuba Week will take place on March 26th -April 2. 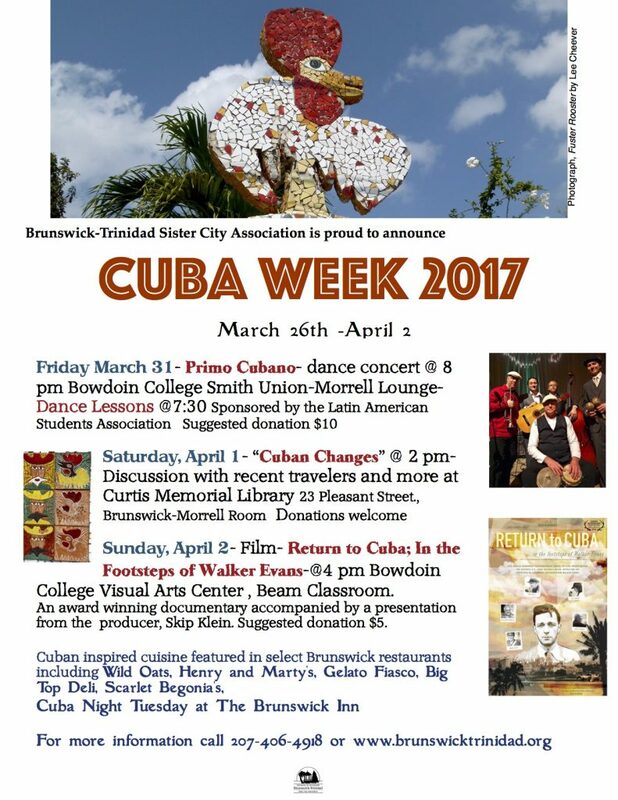 There will be a display in the Curtis Library during the month of March, a concert featuring the popular group, Primo Cubano, a lively panel discussion with Cuba travelers, and a film shown at Bowdoin College- In the Footsteps of Walker Evans. This entry was posted in Uncategorized and tagged #CubaWeek #BrunswickTrinidad #MainetoCuba #celebrateCuba. Bookmark the permalink.